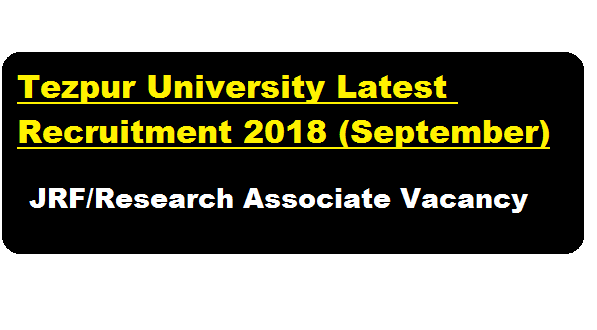 Tezpur University Recruitment 2018 – Junior Research Fellow/ Research Associate :- Recently, Tezpur University has issued a vacancy notification in September 2018. According to the Latest TU Recruitment 2018 September, A walk-in-interview will be held on 14/09/2018 at 11.30 a.m. at the Office of the Head, Department of Chemical Sciences, Tezpur University for the temporary positions of one (01) Junior Research Fellow (JRF) and one (01) Research Associate (RA) in a DST Nanomission sponsored project entitled “Theoretical investigation of Methane Oxidation Catalyzed by Metal Nanoclusters Supported on Zeolites” under Dr. Ramesh Ch. Deka, Professor, Department of Chemical Sciences, Tezpur University. The detailed info can be found below. Research Associate- Candidates must have Ph.D. in Chemistry and experience in Computation Chemistry. Junior Research Fellow:- Rs. 25,000/- (Rupees twenty five thousand) only + 10% HRA as admissible per month for the first two years and Rs. 28,000/- (Rupees twenty eight thousand) only + 10% HRA as admissible per month for the 3rd year (SRF). Duration: Three years or till completion of the project or until further order, whichever is earlier. Age Limit : Candidate shall not be more than 28 years of age for Junior Research Fellow and 38 years of age for Research Associate on the date of interview. Upper age limit may be relaxed as per Government of India rules. Eligible & interested candidates may appear before the interview board with original and self-attested photocopies of mark sheets, certificates from 10th standard on wards, testimonials, caste certificate (if applicable), experience certificate, certificate of NET or similar examination qualifications, any other testimonials and a copy of recent signed curriculum vitae (CV). Walk-in Interview Date: 14/September/2018 at 11.30 a.m.